On the 12th of August, members of San Francisco’s windsurfing community helped to rescue a small dog that was swimming in the San Francisco Bay! We are designing him a new 83 liter hi-wind board. We hope you enjoy this hart warming story with a very happy ending. This morning I had the opportunity to read the news story your wrote in the San Francisco Chronicle As one of the windsurfers that came to the aid of the Labrador yesterday off of Treasure Island, I thought I would share some of the facts, and to identify to you the person that I believe to be the “true hero” in all of this. He is one of windsurfing community, and a incredibly compassionate man. He is Ed Coyne, of San Rafael, CA. Ed and I were windsurfing together about a mile north of Treasure Island when Ed noticed the labrador (mix) swimming aimlessly in the bay. As is evident in the photograph, the winds were up in the bay and there were substantial waves which were breaking periodically over the head of the dog. Ed was determined to come to the aid of the dog, and to do everything possible to ensure that the dog would not drown.. He sailed near the dog and tried to garner her attention with commands of “Come here”. Nevertheless, the dog kept swimming towards Alcatraz. Ed sailed out ahead of the dog to get in her path and then single handedly Ed secured her by the nape of her neck to place the dog on his windsurfing board. Ed hailed other windsurfers who then joined him to assist. As most of us carry VHF radios, I hailed the Coast Guard to report the situation and to request Coast Guard assistance. 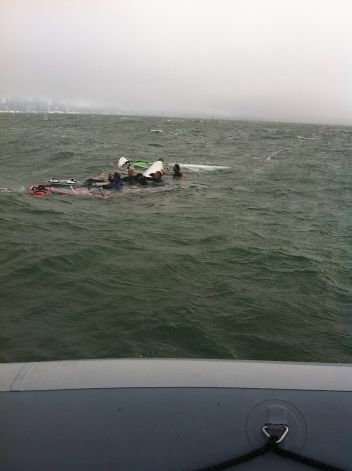 Shortly after placing the distress call on Channel 16 to the Coast Guard, Mr. Cohen and his friend were motoring back towards the East Bay and the flotilla of windsurfers then assembled to assist Ed Coyne and the dog waived their arms to indicate that assistance was needed. At that point, Ed Coyne coordinated the transfer of the dog to Mr. Cohen’s boat with a request that he take the dog to the Berkeley Humane Society to attempt to find its rightful owner. This is a wonderful story with a happy ending. That dog has one person to thank in particular, and it is Ed Coyne…truly this dog’s best friend! Love this! What a lucky dog.